For fun the past few months I’ve been taking e-courses from British photographer and blogger Susannah Conway. Prior to signing up for Susannah’s courses I had no idea that people often photograph their feet. Susannah says it’s to show where we are in the world—not just our extensive shoe wardrobes or the state of our pedicures. Through her courses I’ve seen photos of feet in boots, sandals, leopard-spotted driving shoes, tap shoes and barefoot. I’ve seen shots of them in gardens, on beaches, in bathtubs and hammocks. I’ve seen them side-by-side with children, lovers, dogs, cats and friends. I now have a series of my own feet shot in exotic locations like my laundry room and front porch. Initially these feet photos seemed like something a tween would snap between Twilight videos, but with time they’re working their charms on me. I look less at the shape of the feet or the color of the nail polish and more at the soul attached to these soles. Where are they walking? Who are they walking with? Why are they there then? 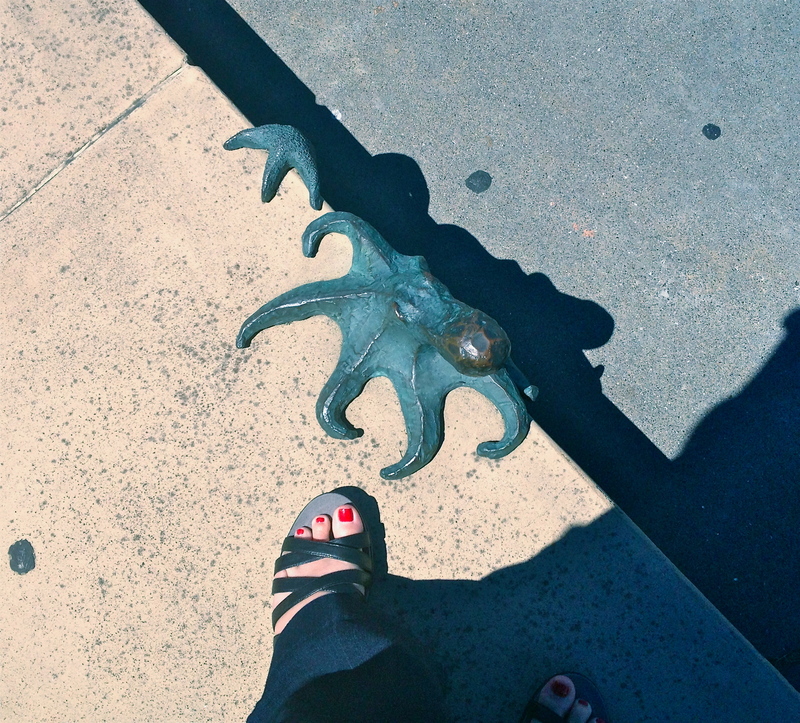 Like the toe-to-tentacle shot of my sandaled foot after a friend’s birthday lunch or the poolside portrait of my Big Apple Red nails next to my husband’s birthmarked foot on our 33rd anniversary, there’s often more than tootsies to tout in these images. Do you ever snap photos of your feet to capture a place and time in your life? 1.The flippered mermaids in this charming video. 2. Jill Lepore’s wonderful teaser for her new book on Benjamin Franklin’s sister Jane. 5. The perfect summer tea towel. 6. Musings on hosting houseguests by David Sedaris. This entry was posted in Shelter, Spirit, Style and tagged architecture, fashion, feet photos, history, hospitality, photography. Bookmark the permalink. Post a comment or leave a trackback: Trackback URL. Perfect timing! I was just looking at my instagram and noticed a lot of photos of my feet. 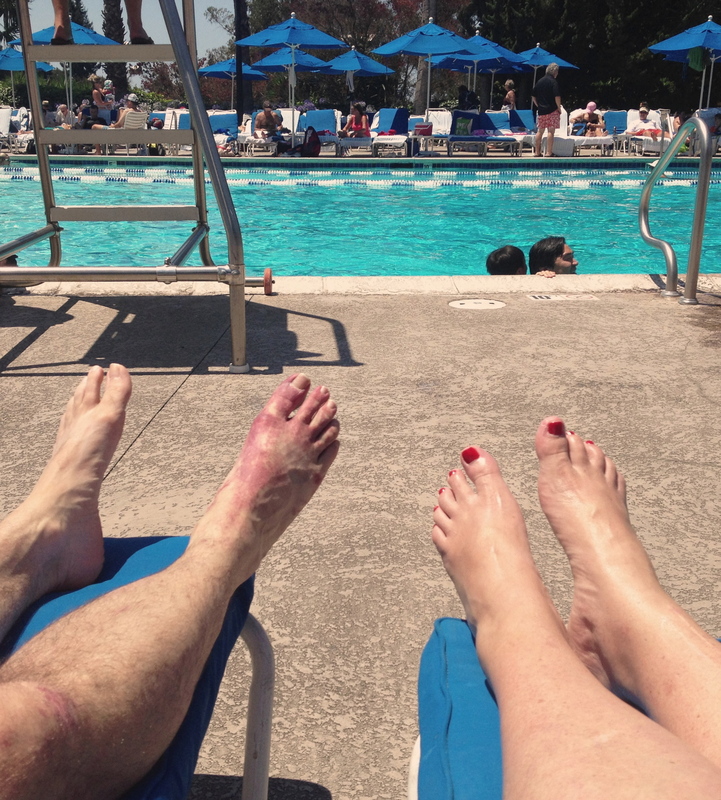 I guess we all have a tendency to show of where we are standing…or our cute toes. Hello! I am new to your blog. What a nice place you have created here. I love the words about feet and photos. I think I might have to do some feet photos myself. I love the thought of taking a picture of where we stand. 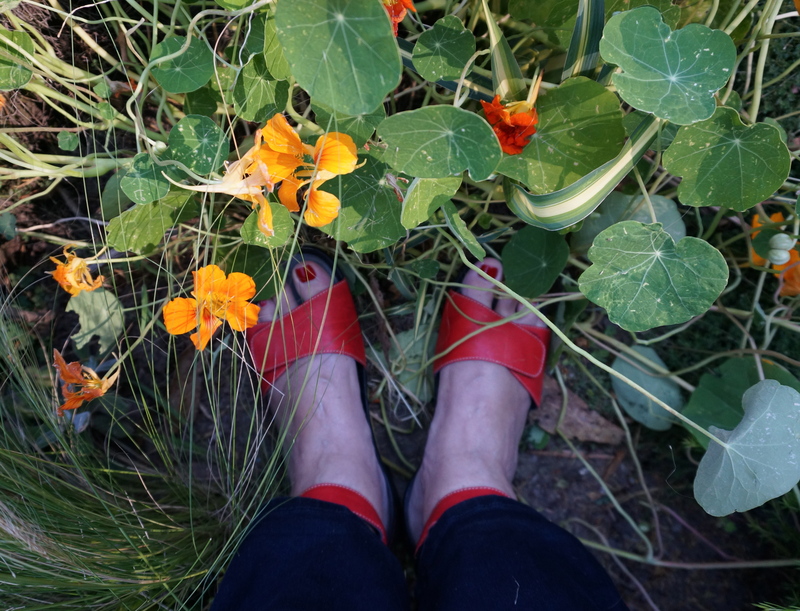 And, I love your red sandals in the last photo! Welcome! Glad you found me. And yes, feet photos–should be a “kickier” name for these than this, but I don’t know one–are fun. No need to worry about how thin you are or how snazzy you’re dressed–just how/where/when you put one foot ahead of the other. I am doing feet photos all this month, maybe it will even continue on after that we will see.